While immigration detention is increasingly becoming a topic covered by mainstream media, the voices of those directly affected by detention often remain absent. In an effort to fill this void, Community Initiatives for Visiting Immigrants in Confinement (CIVIC) is launching a series of blog posts called "Words Beyond Walls." In this series of posts, we will explore the reality of living in U.S. immigration detention centers through individuals who are in the best position to describe it. We hope to foster critical reflection about the values that inform the immigration detention system and our response to it. 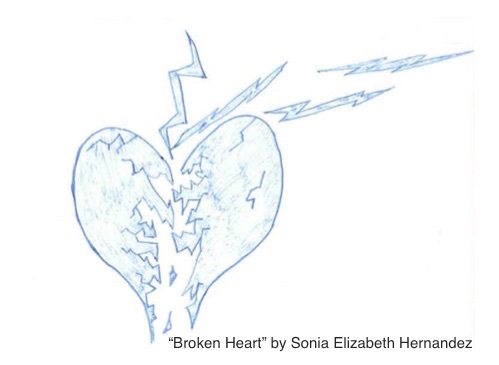 Our first writer and artist is Sonia Elizabeth Hernandez, who is currently detained at the Karnes County Residential Center in Texas with her three children: Abi who is ten, Valentín who is nine, and Moises. Moises recently celebrated his third birthday behind bars, and Abi will be celebrating her 11th birthday soon. The family has been in U.S. immigration detention for over six months, and there is no end in sight. I have been in U.S. immigration detention for six months and 17 days. It has been very difficult for me and my three children, and I am desperate now. I ask for strength from God. It is difficult when the food they feed us is different from what I am used to cooking for my family, but you have to eat it because there is nothing else. It hurts me when my children silently refuse to eat. And instead of gaining weight, I have to watch them lose pounds because I can't give them adequate food in here. I'll write more later because I feel sad, and I try to hide from my children my sorrow and my pain. This is the first in a series of posts called "Words Beyond Walls." To support Sonia and her children, sign her petition and ask the U.S. government to release her. Check back in for more posts in this series in the coming months.